Ripe honeydew has a consistent pale greenish yellow outer layer; if green veins are evident it is not ripe yet. The fruit should have a light yellow or golden color a little brown freckling is a plus that indicates enhanced sweetness. The honeydew should smell sweet at the spot where it was connected to the vine. If it does not have a scent then it is not yet ripe. Squeeze the melon, it should not have any spongy spots but should be firm and not hard. Too hard and it’s not yet ripe, too soft and it’s overly ripe. Honeydew should fell heavy for its size. Honeydew should be stored at room temperature until it is ripened and then it should be stored in the refrigerator for up to 2 weeks. Sliced honeydew should be stored in an airtight container in the refrigerator. Cut the honeydew in half and remove the seeds as well as the rind. Cut the fruit into slices, cubes or balls. Spread the honeydew pieces in a single layer on a baking sheet and place in the freezer until thoroughly frozen. Then transfer the fruit to an airtight container or freezer bag and store them in the freezer. Honeydew can also be frozen in sugar syrup. 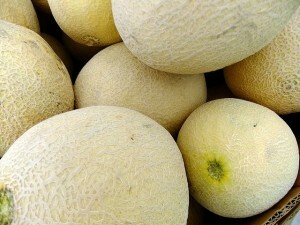 If underripe melons are picked they will not reach their full sweetness as the sugar content will not continue to increase after they have been harvested. However, you can sprinkle pieces of honeydew with sugar so they can still be enjoyed. If the honeydew is discolored or hard, you can place it in a paper bag with an apple or banana to use the ethylene gas to improve the aroma, color and to soften the fruit.